With the launch of the Galaxy Note9, Samsung introduced the concept of using the S Pen as a remote shutter button. The facility would prove to be useful for selfies and group photos. Now it looks like Samsung is looking to stuff a lot more imaging tech into the S Pen, as a patent reveals it has been working on hosting a zoom camera within the pen's barrel. 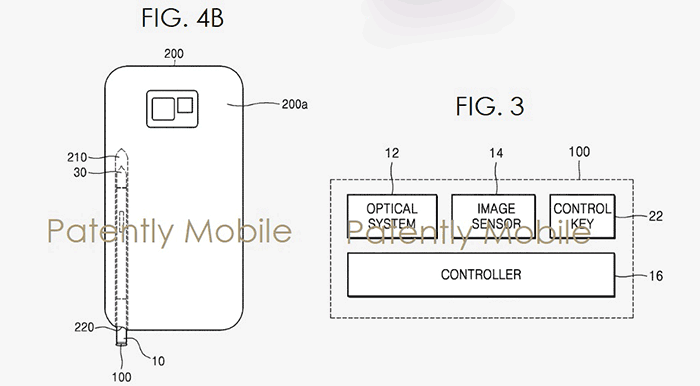 A patent for the system described above was filed by Samsung in 2017, and granted by the U.S. Patent and Trademark Office just yesterday, when it was published by the governmental regulatory body. Patently Mobile was quick off the mark, as usual, to report on the patent substance and what it might mean going forward. Due to the nature of optics, a long zoom requires a deep stack of lenses. Becasue of this, smartphones have instead resorted to fitting multiple various 'primes' to the rears of smartphones to effectively offer a stepped zoom range with software to enhance their appeal. Others have tested 'periscope-like' lens arrangements to bypass body thickness impacts - most recently Oppo teased such a 10x optical zoom smartphone system. 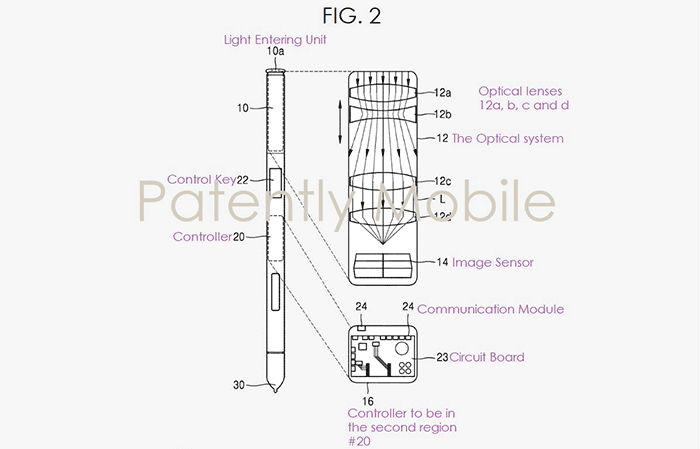 Back to the recently unearthed patent, and Samsung describes how the zoom lenses fit into the pen with an image sensor and communication module to relay image data to your smartphone. There are multiple alternative lens setups shared in the patent, as well as the one shown in our example image. Another nice feature of the S Pen zoom camera is that a physical switch on the pen barrel is used to control the level of zoom. This could be an intuitive rocker style switch for zoom-in / out. Remember that Samsung has started to add S Pens to devices beyond its Note smartphone and tablet range. Thus this patented camera might find its way into future hybrid, laptop and AiO PC designs too. Whereas I love to… I'm thinking about it right now, in fact!! Interesting idea, but I'd be surprised if it saw the light of day. Besides, can you imagine how hard it would be to hold a pen sized telephoto camera steady while trying to aim it at an object. Not to mention the coordination required as the image would still be displayed on the phone. Looking at the article, it seems that side of things would be handled by the regular camera on the handset. The pen is for things like the inside of an engine, or mounting up high somewhere. Various remote uses, basically, and likely ones where it can be braces against something to keep it steady. I also imagine know a mini-tripod would be pish-easy to design and implement, for those that really needed it. Aim with the head using the image displayed on the phone. This will probably get as bad a press as Google glass.